Ever feel like you’re one step away from looking under sofa cushions to cobble together your next rent payment? You’re probably not alone. In past studies we’ve highlighted cities where rent payments are gobbling up the majority of residents’ incomes. Below, we look at data on the largest cities in the country to see how many hours the average person needs to work to pay rent. Does it make more sense for you to rent or buy? In order to determine how many hours a person needs to work to pay rent, we looked at data on typical working hours, incomes and rents for the 15 largest cities in the United States. To understand where we got our data and how we put it together to create our final figures, see the data and methodology section below. Big city living will cost you – In two cities – San Jose and Los Angeles – more than half of folks’ working hours go toward making sure they can pay the rent. Even in Indianapolis and Columbus, where you need to work the fewest hours to pay rent, folks still dedicate an average of 53.8 hours of work per month to it. Exorbitant California – Perhaps this is not surprising, but four out of the top five big cities where people have to work the longest to make sure they have roofs over their heads are in California. Of all the cities in California, Los Angeles is probably not the first to spring to mind when you’re thinking about sky-high rents. And it’s true that Los Angeles residents don’t pay as much in rent compared to their San Francisco or San Jose neighbors. Average monthly rent in LA is about $1,200, according to the Census Bureau. That’s about $350 less than San Francisco or San Jose. But folks in Los Angeles only make $13.78 per hour on average, which is why the city tops this list. To pay rent in Los Angeles, the average person needs to work 87.7 hours per month. Folks in San Jose put in an average of 162 hours of work per month and of that, 84 hours end up going to rent. In other words, on average, San Jose workers dedicate over half their working time to paying rent. San Jose residents are fortunate in that they are paid the second-highest median hourly wage in the country at $18.86. Unfortunately they also have the highest median monthly rent payments to deal with at $1,585. The Big Apple comes in third for places where people are probably saying the rent is too high. Workers here earn an hourly average of $15.74. In order to make enough to pay the rent – which averages $1,255 per month – New Yorkers will need to work for just under 80 hours. Of course not everyone in New York is earning an hourly wage of $15.74, but our paycheck calculator can help you see where you fit in. Check out: SmartAsset’s free paycheck calculator. San Diego is the third California city in the top 5 and it ranks fourth overall on our list. Data from the Census Bureau shows that the average worker in San Diego works about 164 hours per month. The average rent in San Diego is $1,377. In order to pay that, residents have to work 77 hours a month on average. San Franciscans spend about 10% less time working to cover rent than their San Diego neighbors. Residents in San Francisco fork over the second-most in rent payments at $1,558 per month on average but are also the most well-compensated workers in our study. Workers in San Francisco earn just shy of $22 per hour on average. San Franciscans are some of the hardest workers in this study, putting in an average of 171 hours per month. Of that, just under 71 hours go toward making rent payments. The City of Brotherly Love claims the sixth spot. The rent in Philadelphia is a very reasonable $922 on average. And its residents make $13.24 per hour on average. Taking those two numbers together shows that renters in Philly need to work just over 69 hours per month (on average) to pay rent. The Windy City comes in seventh but it takes six hours less for the average worker here to afford rent than it does in Philadelphia. Chicago workers earn an average of $15.23 per hour and put in 165 hours at work per month. The average monthly rent in Chicago, including utilities, is $965. Chicagoans need to work for 63.4 hours per month on average to cover their rent payment. San Antonio has the cheapest rent of all the Texas cities on the list, but its residents also make much less than their Texas counterparts. On average, workers in San Antonio make $13.53 per hour and work about 167 hours per month. To cover the monthly median rent of $856, the average San Antonian must work 63.3 hours. To see how much more affordable rent is in Houston compared to Los Angeles, consider that Houston workers and Los Angeles workers make about the same hourly wage – a little less than $14 per hour. However median rent in LA is $350 more than it is in Houston. To pay rent in Houston, workers need to put in just under 63 hours a month on average. Jacksonville comes in closely behind Houston, with residents dedicating 62.4 hours of work on average to make monthly rent payments. Jacksonville looks very similar to Chicago in terms of data. The median monthly rent in Jacksonville is $935, just $30 less than it is in Chicago. And the average Jacksonville worker makes about $0.25 less per hour than the average Chicago worker. Jacksonville residents put about one less hour of work toward rent each month as compared to workers who call Chicago home. U.S. Census Bureau data shows workers in Dallas work 171 hours per month on average. That means they are some of the hardest workers in our study. Of those 171 hours, workers dedicate 61.7 hours to paying rent on average. Fortunately for renters in Dallas, the city has one of the lowest ratios between average total work hours and number of hours of work needed to pay rent. Workers are well-compensated in Austin. On average they make almost $31,000 annually or about $17.50 per hour. Those higher incomes come in handy when Austin renters need to pay the bills. Rent in Austin is higher than any other Texas city in our study. The U.S. Census Bureau estimates that monthly median rent in Austin is about $1,050. Similar to in San Francisco, that high rent is relatively affordable given the median income. Austin workers need to work 59.8 hours per month on average to cover rent. Phoenix is another affordable option when it comes to renting, at least relative to other big cities. 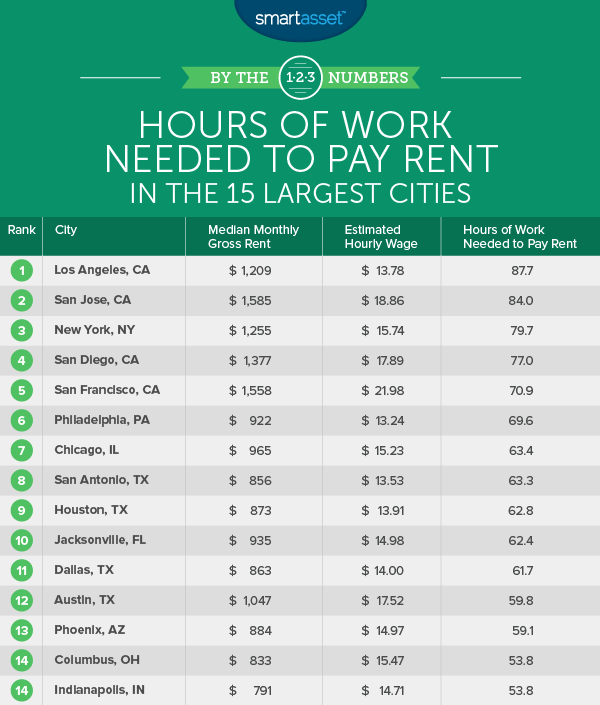 About 35% of working hours – 59 hours – go toward paying the rent in Phoenix on average. Monthly median rent costs come to $884, which includes air conditioning for that hot desert sun, and workers here get paid an average of $14.97 per hour. That means they pay almost the same median rent as folks in Dallas, but make an extra dollar per hour. Nice! Workers in Columbus get paid a similar amount to workers in New York, just 27 cents less per hour on average. But median rent in Columbus is a whopping $400 less than it is in New York. That means a difference of $4,800 per annum (and a possible headstart on saving for a down payment). Columbus workers need to put in 53.8 hours on average to earn enough to pay the monthly rent. 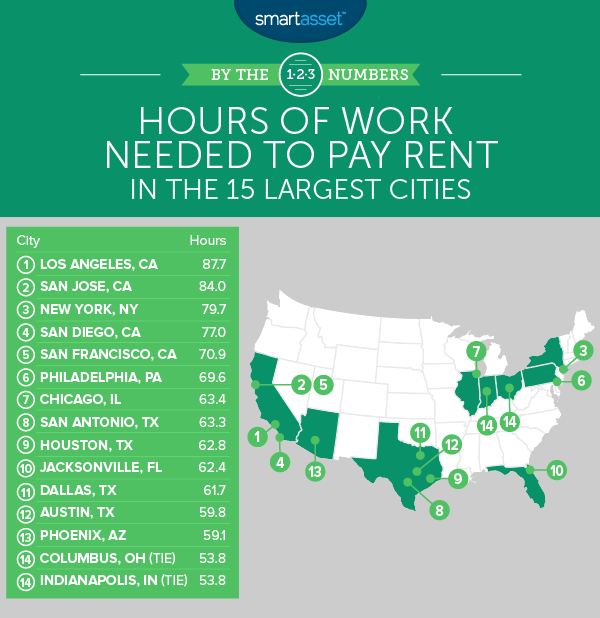 Coming in tied with Columbus for least number of work hours going to rent is Indianapolis. To afford monthly rent here, workers will need to put in 53.8 hours on average. The median monthly rent in Indy is below the $800 mark but workers are still relatively well-paid, making an average of $14.71 per hour. Average hours worked per week. Data comes from the U.S. Census Bureau’s 5-Year American Community Survey. Average weeks worked per year. Data comes from the U.S. Census Bureau’s 5-Year American Community Survey. Median annual individual income. Data comes from the U.S. Census Bureau’s 5-Year American Community Survey. Median monthly gross rent. Data comes from the U.S. Census Bureau’s 5-Year American Community Survey. This number includes not only the cost of rent but also utility payments. After getting data on these factors we estimated the number of hours worked per year per worker. To find this, we multiplied the number of hours worked per week by the number of weeks worked per year. After establishing the number of hours worked per year, we divided that number by the median individual income to get an estimate for the hourly wage. We then divided the median monthly gross rent by the hourly wage to estimate how many hours the average worker needs to work to cover rent costs.